Despite military occupation and rising social tensions in Palestine, Abed defies the odds to find space for music, sport & play. The Israeli-Palestinian conflict has resulted in unequal educational opportunities for many young people in the occupied areas. Unicef recently reported that nearly one in four children growing up in conflict zones around the world are out of school. Children who lack accesses to formal education opportunities have even less access to sports and extra-curricular activities. In light of these challenges, Abed decided to do something to support the youth in his community. Abed’s social capoeira project started in May of 2014 when he was still working with Bidna Capoeira (now Capoeira4Refugees) in Bethany. 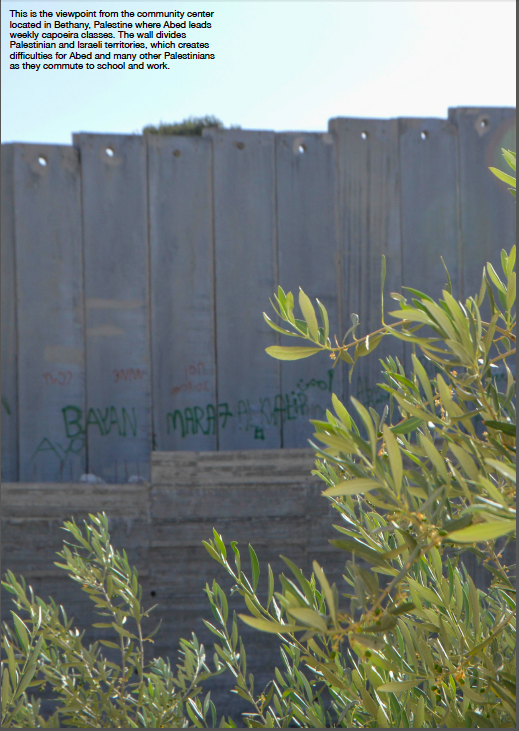 Residents of Bethany, one of the three Israeli-controlled administrative divisions in the West Bank, receive limited access to basic services. 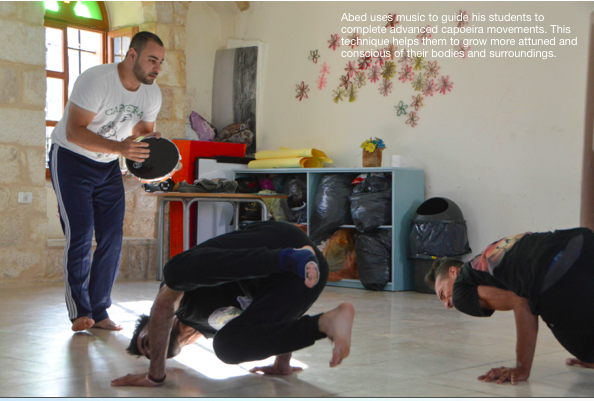 With support from a few donors, Abed started teaching capoeira to fill in the gap. Although funding for the project through Bidna Capoeira ended in August of 2015, Abed continues to devote his personal time and resources to keep the group going. Working in Bethany has not been easy. According to a UN report, nearly 300,000 Palestinians are living in the area, and tensions have been high since last autumn due to disputes over access and land. As a result, Palestinian children lack a safe space to play. Despite these challenges, Abed continues to fight to get a more permanent space for his students to practice capoeira. Abed also constantly strives to promote gender inclusivity in his classes. In the past, he has taught many girls classes in some of the most conservative areas in Palestine (such as Sur Baher Village, Bethany Girls Orphanage, and Shufat Refugee Camp). He is one of few male trainers allowed to work with girls, having earned the trust of many families. 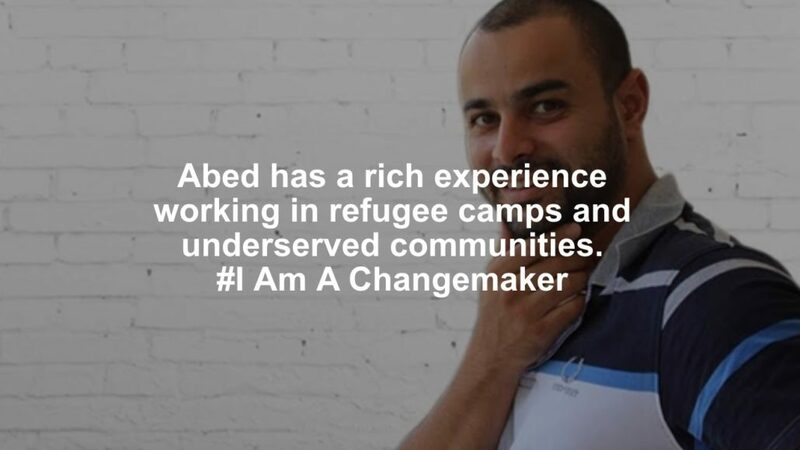 Abed has made it his personal mission to promote gender equality through music, sport and play. He has inspired and equipped his assistant, Amer (picture above second from the left), to start a boys and girls capoeira class in his own neighborhood. Abed’s students huddle together for a cheer before ending capoeira class. This energy within the classroom allows them to momentarily escape from the stresses of occupation and keeps them going for the rest of the week. 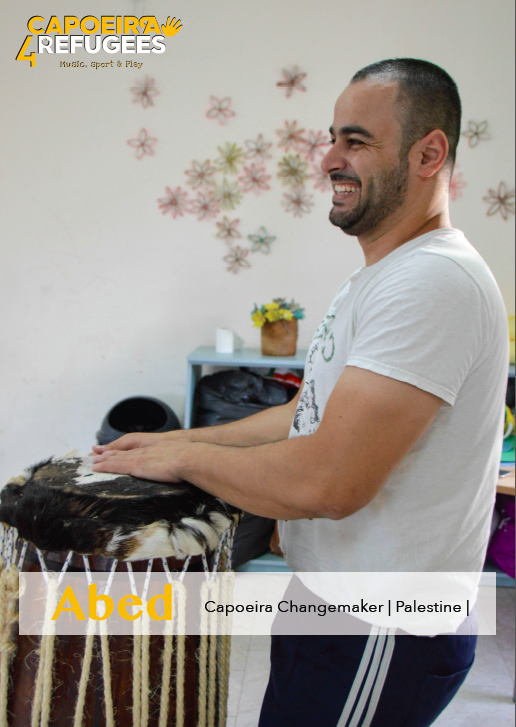 For Abed, becoming a Capoeira Changemakers Fellow means being able to offer children and youth continuous access to activities that they otherwise would not have access to.